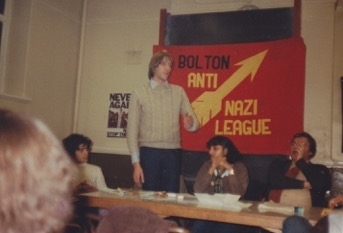 Two photos sent in by Ramila Patel of a Bolton Anti-Nazi League meeting around 1978 - the year of the Northern Carnival Against the Nazis. Amongst the speakers at the rally was Ramila Patel, then a 21-year-old from neighbouring Bolton. 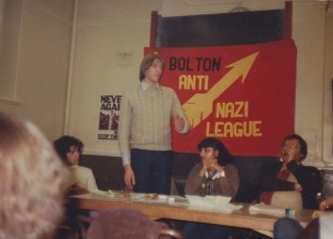 Like many other Asian youths facing the multiple threats of advancing racist groups like the National Front and growing unemployment, Socialist Workers Party member, Ramila became involved with the Anti Nazi League and helped to form a Rock Against Racism club in Bolton. She was chosen to speak at the rally because of her defiant solo march in front of Martin Webster, the National Front leader, on the streets of Hyde, Tameside in October 1977. Parallel to racist events unfolding on the streets, Strangeways Prison in Manchester had a notorious reputation for employing prison warders who were members of the National Front, therefore the Anti Nazi League planned to begin the Northern Carnival against Racism outside Strangeways Prison. Recalling her address to the carnival crowd of 15 000 at Strangeways, she says: “It was an emotional moment and I felt an acute sense of solidarity with the crowd. Being part of the Socialist Workers Party and working with like-minded people against the government's cuts and pay freeze, the so-called 'Social Contract' was the way to defend working class organisation.